If you have combination skin, then you know what the term “T-zone” means. In fact, you may sometimes feel like your skin has a split personality—oily with large pores on the forehead, nose, and chin, and dry and sometimes even flaky on the cheeks and under the eyes. You don’t have to feel badly, though—combination skin is thought to be the most common type of skin out there. That probably doesn’t help you when you’re trying to figure out how to take care of the dryness on your cheeks without breaking out on your nose, though, right? If you’re someone who is constantly frustrated at trying to make both parts of your skin happy, here are some tips and solutions for you. Combination skin is just what the name implies—skin that is a combination of both dry and oily types. If you drew a big “T” on your face, all the skin under that T would likely be oily, while the areas left outside the T are dry and potentially flaky. That’s why we use the term “T-zone” when referring to those with combination skin. Combination skin also means that you may have fine lines and wrinkles and shininess and clogged pores at the same time. You may also experience uneven skin tone or large pores on your nose. Of course this combination of characteristics and problems can make combination skin particularly difficult to deal with. No matter what kind of skin you have (dry, oily, combination, or sensitive), it’s most likely because of genetics. Just like you inherit your eye color, hair color, and body type from your parents and grandparents, you also inherit your skin type. Where will I notice combination skin? 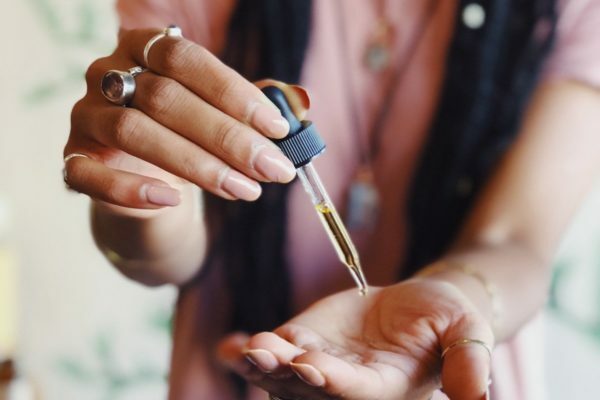 In general, the nose, chin, and forehead of those with combination skin have more active oil glands, which is why these areas may be prone to clogged pores. The cheeks, on the other hand, may have less active oil glands, which is why they may appear dry and flaky. In some cases, however, if you’re using harsh products or products with drying ingredients like sulfates and alcohol, you can actually encourage the skin to produce more oil in the T-zone area, which can also create the symptoms of combination skin. Not sure whether you have combination skin? Try washing it with a gentle cleanser, pat dry, then wait for about 10-15 minutes. (Don’t apply any other products.) Most likely, your cheeks, temples, and other areas will feel dry and tight, while your nose, chin, and forehead will look oily and shiny — or perhaps have clogged pores. Another clue that may mean you have combination skin is that you have a hard time finding skin care products that work. Some make you breakout, while others leave you too dry and dull. do you notice these issues? A challenge with combination skin is to get enough moisturizer into it without clogging pores. You can moisturize from the inside out with essential fatty acids. Eat more salmon, walnuts, and flaxseed, and consider taking a fish oil or flaxseed oil supplement. Things like sulfates, alcohol and soap can strip your skin of its natural oils. You may think that will help your T-zone, but in truth, it will actually encourage it to produce more oil. Stay away from harsh, chemical ingredients. This gets the blood pumping, which delivers key nutrients to your skin. Stress can make your skin more reactive, both the oily and dry areas. Try meditation, yoga, tai chi, journaling, music, whatever works for you. In your skin care and makeup products, always choose those that are made for oily or combination skin. Avoid petroleum-based moisturizers like mineral oil in all your products, particularly moisturizers and foundations. Your cheeks are likely to be prone to dryness, dullness, and flaking, and may also be more prone to irritation. Avoid products with chemical fragrances and other irritating ingredients. With combination skin, the key is balance. You have to find a way to balance what your skin needs in the dry areas with what it needs in the oily areas. Not an easy task, but here are some tips. One more thing to think about—most people with combination skin have one type that’s more dominant. In other words, if you’re struggling with clogged pores, oily skin is your biggest concern. If it’s only your nose that is clogged and the rest of your skin is more dry, dryness is your main concern. Just something to keep in mind as you go about finding your best daily skin care routine. 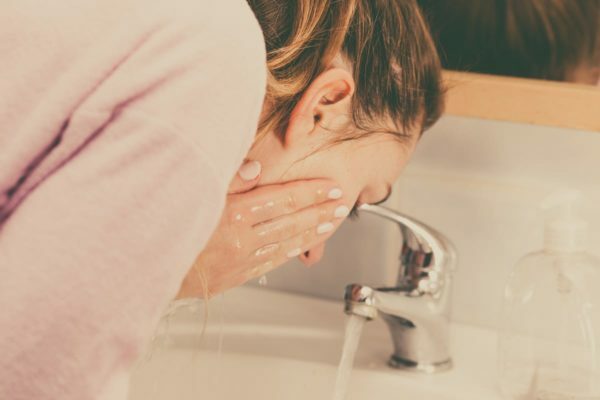 We recommend natural cleansers for everyone, because they provide more benefits without the drawbacks, but for people with combination skin, this is even more important. Chemical-based cleansers will never get you the skin you want because they’ll dry out the dry areas and make your oily areas oilier. Try our Citrus Mint Facial Cleanser. It removes dirt, oils, and impurities, but it doesn’t have any harsh detergents or cleansers, and it helps to balance skin oils, so it will deep-clean your T-zone without over-drying your cheeks. Most toners you find in the store have alcohol, menthol, fragrance, and the like. All terrible things for combination skin. Toss all these out and use a toner that has natural ingredients that will help restore pH after cleansing while nourishing your skin. Try our Rosemary Toning Mist to refresh and balance while controlling oily skin. Most moisturizers are made for either oily skin or dry skin. (Those made for normal skin are usually angled more toward dry types.) Some experts will recommend that you use one of each—heavier moisturizer on your cheek area, and lighter moisturizers on your T-zone. This could work, but the problem is it’s expensive, time-consuming, and prone to error. After all, it’s not like your skin has a chart on it to show you exactly where to apply what. You can overlap and then presto, you have clogged pores the next morning. Our solution—use Herbal Facial Oil. Now, we have two of them. Which one will work for you? Consider what we noted above—whether you have more trouble with oily skin or dryness. If you’re a more mature person, the dryness may be taking over. (Choose Herbal Facial Oil for Normal and Combination Skin.) Younger folks may be more concerned about clogged pores. (Choose Herbal Facial Oil for Oily Skin.) Either one will hydrate without clogging pores, and will infuse your skin with repairing nutrients. All skin needs exfoliation, and combination skin is no different. The oily areas need it to open up the pores and dry areas and allow moisturizers to penetrate. The key with your type of skin is to be gentle on the cheek areas, and scrub a bit more on the T-zone. We would suggest the Ayurvedic Facial Scrub, which will exfoliate without over drying your cheeks, and will also help absorb extra oil and reduce clogged pores. Choosing a mask can be difficult for combination types, as you’re not sure if you should get one that absorbs the oils or imparts more hydration. Endless confusion, right? Not anymore. Just use the Purifying Mud Mask. 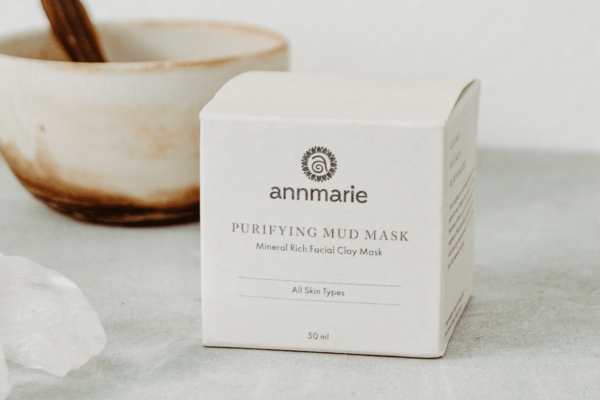 The dead sea clay has a way of naturally purifying your pores without drying. In fact, we’ve included blue-green algae which is high in natural fatty acids that replenish and hydrate. The perfect combination! You may wonder about alpha-hydroxy acids with combination skin. Have you experienced irritation on your cheeks in the past with these products? The key is to use the gentle ones. Here we would go conservative and use the same acids as those recommended for dry skin. Choose those that come from natural sources like fruits (malic), milk (lactic), and sugar cane (glycolic). Apply these products as needed, typically 2-3 times a week. Because all skin types need protection from environmental stressors, we recommend you use an anti-aging product that contains natural ingredients that nourish. Again, you want natural ingredients (not chemical or synthetic), and non-clogging products. Try a light application of our Citrus Stem Cell Serum, which uses citrus stem cells and powerful antioxidants. Use more on cheeks and dry areas, less on the T-zone. Apply the Anti-Aging Eye Cream to repair skin around the eyes, and reduce the appearance of fine lines. Do you struggle with combination skin? How do you cope? Please share any tips you may have. In what order do i use these products? I think I have combination skin but I’m not really sure. My t zone is obviously the oilist part of my skin but it’s also the driest at the same time. It feels very oily but the skin is also very dry and flakey and peeling. So I have no idea what I should use or do! Anyone have any suggestions? Hi Chelsea! If you are not already exfoliating once a week, that might be a beneficial step to implement into your regimen. Using something like our Ayurvedic Facial Scrub would be gentle yet effective. 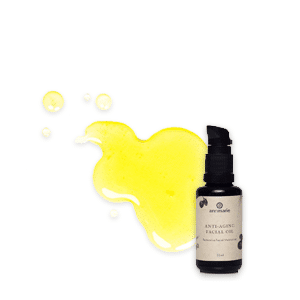 You can follow up with our Herbal Facial Oil for Normal & Combination Skin to moisturize. It sounds like you’re having a pretty unique experience with your skin! Write into us at [email protected] and we’re happy to help you find a routine that will work for you. Thank you very much! For a perfect skin, you should take healthy diet. If you take healthy diet regularly then, it helps you to maintain your skin charming. I’m in my mid thirties i have a combination skin and i have begun to notice some fine lines, wrinkles around my eyes. I now use ONLY the Made from Earth Vitamin Firming Serum because its both a moisturizer and serum. After using for a week, my combination skin felt hydrated, and my fine lines reduced. It goes on the skin very smooth and soak in nicely leaving no oily residue. I am so embarrassed of my skin I can’t wear back out clothes I have no waist line my waist is so narrow and high It seem like I complain about this problem it gets worst so frustrating you have no idea the aggravating that I feel. What should I do????????????????????????????????????????????????????????? It sounds like you’re working with a few different issues. Please write into [email protected] with a bit more detail about what you’re experiencing and we’re happy to help you find a solution. But first grow or buy a grown aloe vera plant from garden and grow it in a dry enviorment. Step 1 – break a fresh part of aloe vera (the closer to the stem the better) and rip it’s thorns and with a knife or bare hands (thats what i use) and rip it’s one side you will se a clear coat of gel now scrub it on the face and make sure you apply till all the gel is on your face and let it be absorbed by your skin you will se imediate reduction of dryness and some oiliness on your face use it regularly. It can work like a scrub, moisturizer, clensear. P.S. Thank for your help, it really helped me with all this detailes i was able to find this remedy. Just want to say thank you soooo much for helping me out!! I am soo happy that I found this and I can’t wait to follow these great tips and try out my new face products. I was really lost at first , I didn’t know anything about my face since I’m a teenager. I’m glad I researched this because I really needed it. I appreciate it and thanks again! Thank you. That was a really thorough breakdown of everything you need to know about combination skin types. Normally combination type is overlooked because its not as easy to deal with. Thank you so much. Do you have a sample kit for combination acne prone skin type? I would love to try your product but I must also be cost conscious if this product does not work? Can you help with my delimna?